Particle board is an engineered, manufactured wood product that was first introduced to the building industry in the 1940s. A hot-pressed composite made from wood flakes, chips, splinters, shavings, sawdust and a binding agent such as synthetic resin, particle board has certain desirable attributes. It has great density and weight for its size, and that makes it strong. It is less expensive than conventional wood. Its disadvantages are related to the fact that it is a heat and glue molded wood product. Particle board has advantages and disadvantages. Particle board tends to absorb moisture. 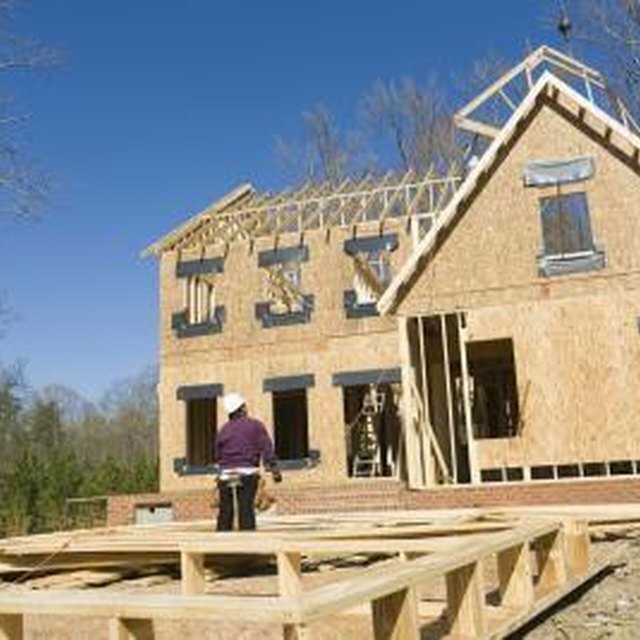 The ends or edges of a sheet of particle board, usually 4 feet by 8 feet in dimension, are even more vulnerable to absorbing moisture than the flat surface. Once moisture penetrates, particle board is inclined to weaken, warp and lose its characteristic strength. When particle board comes in contact with moisture, it can expand and darken in color. For that reason, unless it has been manufactured and treated with a sealing agent specifically for exterior use, it is not used outdoors. It can be and has been used for kitchens and bathrooms as a subsurface. Provided it is covered so water cannot penetrate and reach it, it is a reliable product. In homes, particle board often serves as a base for a countertop covered with tile, stone or other nonporous surface, or as floor subsurface covered with a continuous sheet of moisture-proof flooring vinyl. Particle board that is formed using urea formaldehyde has been known to be an environmental source of formaldehyde gas. Formaldehyde gas can be emitted long after the product manufacture, and the concentration of emissions can actually increase with exposure to humid conditions and rising temperatures. The adhesive can break down and release the gas. The gas can cause health problems. Some of these are nausea; watery eyes; eyes, nose and throat with a burning sensation; headaches; fatigue; and difficulty breathing. The US. Environmental Protection Agency notes formaldehyde gas as a "probable human carcinogen" Because of these dangers, some particle board is being manufactured with a different adhesive, phenol formaldehyde. Products made with this adhesive, which releases either far less or no formaldehyde gas, are recommended.